Kvant 2, the first of two expansion modules planned to enlarge the Mir space station complex, arrived at the station on 6 December 1989. The three-section addition, originally called Module D, was launched from Tyuratam on November 26, via a three-stage Proton-K booster. It was originally scheduled to dock on December 2, but was delayed by technical problems. 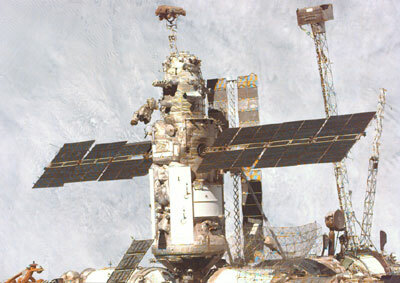 The new module successfully docked at Mir's front axial port. Two days later, a Liappa docking arm re-docked the module at the upper radial port. A cylinder, it measured 13.73 m long and 4.35 m maximum diameter. Two 26.6-sq-m solar panels provided 6.9 kW of power. The module was divided into a service/cargo section, a payload/equipment section and an airlock permitting easy exit and entrance to Mir during EVAs. Kvant 2 carried an East German multi-spectral remote sensing camera and an Ikar ("Icarus") manned maneuvering unit. ASPG-M scan platform carrying ITS-7D IR spectrometer (using the Czech sensor platform first used on Vega spacecraft). MKF-6MA Earth resources film camera - 6 spectral bands. Provided by East Germany. Sprut 5 charged particle spectrometer (installed 1991).